I was struck the other day by reports that President Obama last fall opposed the near unanimous recommendation of his advisors that the US arm Syrian rebels. (The USG has now decided, according to press reports, to provide some rebel groups with direct, non-lethal aid.) Although history may yet judge Obama’s reticence harshly, I couldn’t help but feel good that at least one senior US official–in this case the President–expressed concerns about the efficacy and unintended consequences of the traditional foreign policy “toolkit.” Certainly during my time in government and really just as a private citizen I’ve noticed that the actions of government don’t often seem to achieve their ends neatly, if at all. As far as the world is concerned, we only have one “N”–there is only one earth and one history. We have no way of really judging the absolute efficacy of the grand schemes and decisions of government. We don’t really know how things would have turned out, for example, if we had never had the War in Vietnam. There is no John Madden-like sports simulation for foreign policy that would let us replay 100 times the US Government’s Asia policy in the 1950s and 1960s to determine statistically which gameplan would have fared better. I think actually it may be in part due to this “unknowingness” that decisionmakers not just in government but in many industries stress the importance of making confident and fast decisions–why being a “J” on the Myers-Briggs is such a highly valued executive characteristic. The individuals who want to think through the decision a little bit longer–let’s call them the Let’s-think-about-it Firsters–are almost always argued down. 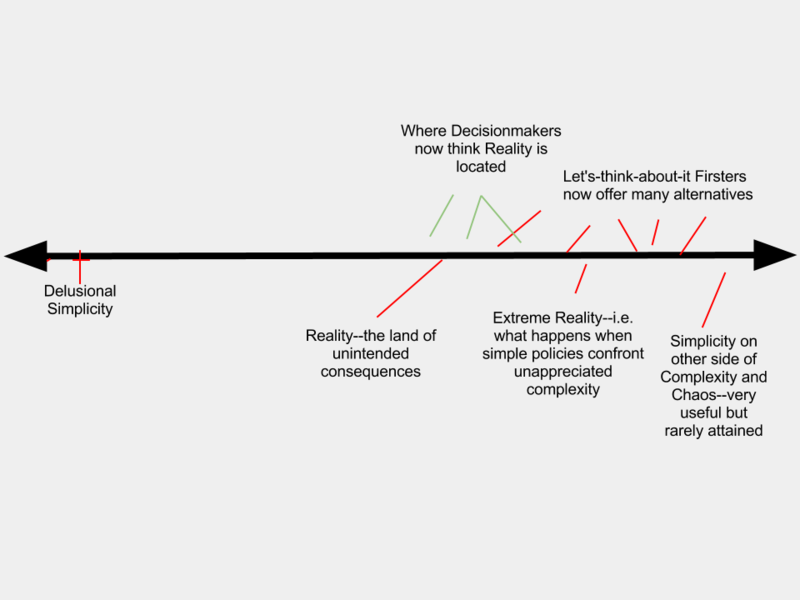 No doubt this chart –inspired by the Cynefin framework–is a bit unfair to strong decision-makers, but it nevertheless captures how I, a charter member of the Let’s-think-about-it Firsters, see the dynamic. 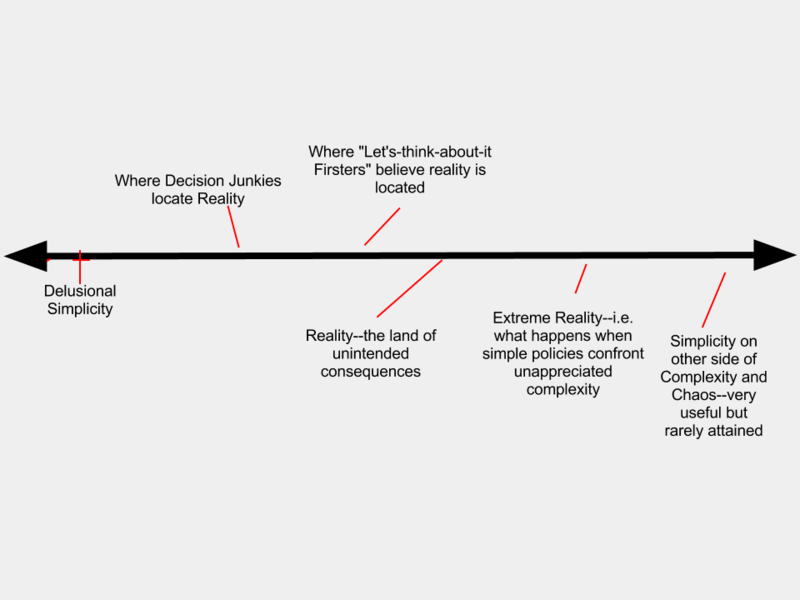 As I hope the chart makes clear, even the Let’s-think-about-it Firsters miscalculate the reality algorithm. At some point, months, perhaps years later, the decisionmakers begin to experience the miscalculation of their earlier solutions. (I use the verb “experience” here purposefully. It’s hard to change a decision you’re invested in until you FEEL the mistake you’ve made.) The levers they pulled didn’t deliver the causal punch they expected and–usually worse–produced different consequences that appear to be just making things worse. That’s when the decisionmaking dynamic begins to look like this. As is usually the case, I don’t have a “solution” for this predicament. There probably isn’t one. Perhaps the best approach is for everyone to be a bit more humble about their recommended courses of action. And always be ready to revisit decisions you made, even if you were positive they were the right thing to do. This entry was posted in Foreign Affairs, Leadership, linkedin, Organizational Dynamics, Thinking and tagged decisionmaking. Bookmark the permalink. I think a certain amount of the rush to intervene found in U.S. foriegn derives from the somewhat naive belief that most conflicts are good vs evil and if we are not actively supporting the good, we thereby passively support the evil. Decison makers seem to discount the posibility that conflicts can be evil vs evil and supporting one side or the other will only gain us another enemy without really earning us any allies. This is a good post that raises an important problem. Much of the problem is that the high achievers who are present at councils of the good and great such as Obama’s NSC are, by definition, people with a bias for action rather than reflection. These are people who have been rewarded for getting-things-done, probably since their first election to Student Council in 7th grade. This trait is exacerbated by the short mandates of office-holders (government or corporate). This phenomenon has been painfully present in Our Great National Adventures in Mesopotamia and Beyond the Hindu Kush over the past 12 years. Nearly all the soldiers, diplomats, spooks, aid workers, and others in these efforts have been deployed on 6 to 12 month assignments–meaning they intend to get-things-done in that framework. The result, of course, was described by MacBeth–full of sound and fury, but signifying nothing. We’d be much better served by political and business leaders who would take the sage advice of Getulio Vargas, Brazili’s strongman in the 30s & 40s–“Deixe como esta par ver como e que ficar” (leave things be and see what they become).